Only one chance to buy it now. 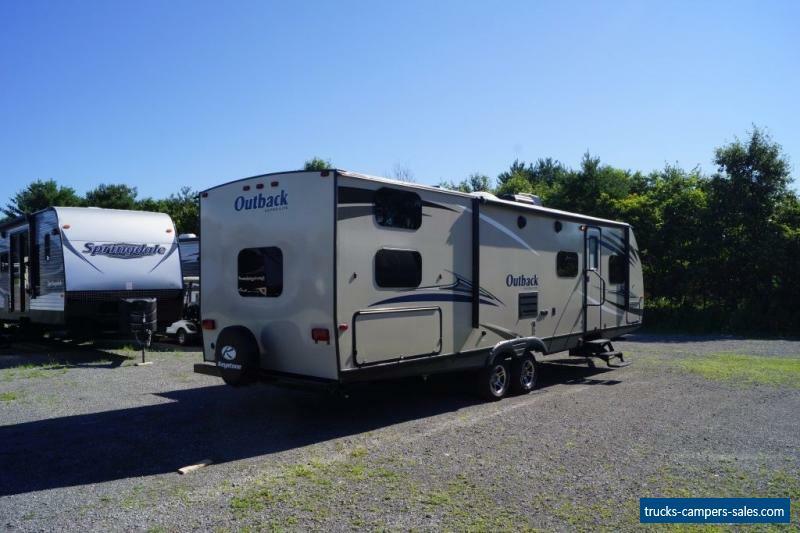 $20,946 Contact Scott at 231-399-2037The front bedroom in the 2017 Outback Ultra Lite 293UBH holds deluxe innerspring queen-size mattress with dual bedside wardrobes. TV hookup and integrated speakers are provided in this space, and couple’s lights are also included so that you can curl up with good book before drifting off to sleep. Retreat into the relaxing living area and kick up your feet on the comfy sleeper sofa which is lined with cabinets overhead to store DVDs, books, blankets, and games. Pop movie into the DVD player and enjoy your 32” HD TV and Bluetooth stereo. Cook up all of your signature dishes in the kitchen of your 2017 Outback Ultra Lite 293UBH! Store your ingredients in the pantry which comes with removable shelves, or fill up pot of water for boiling easily with the high-rise faucet and deep basin sink. With 3-burners, you’ll have plenty of room on the stovetop to make full dinners, and you can use the oven to get started on dessert! Dig into your mouthwatering meals at the adjacent booth-style dinette which is situated alongside large panoramic window providing you with picturesque dining experience every single time you sit down to enjoy some food! Store your leftovers in the 8-cubic-foot refrigerator and heat them in jiffy the next time you’re hungry using the stainless steel microwave. The rear bunkhouse is ideal for little campers or as guest room. Multiple bunks, storage, and dinette table are all included in this space. The interior of the 2017 Outback Ultra Lite 293UBH is complete with hand glazed mystic maple cabinetry, pleated shades, and LED lights throughout. The exterior features an impressive outdoor kitchen so that you can cook up camp cuisine in the fresh, open air. Grab cold drink from the outdoor refrigerator and devour your meals in the shade cast by your electric awning with an LED light strip. 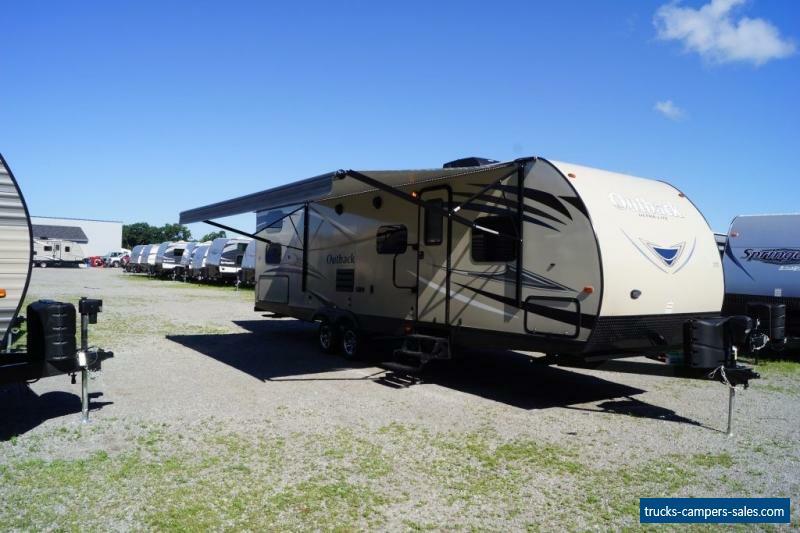 The champagne colored fiberglass design is sure to make your neighbors at the RV park jealous!